Microglia are immune cells in the brain. A new Alzheimer's risk gene called TREM2 is expressed in microglia, giving hints that microglia may have a role in removing toxic beta-amyloid from the brain. Image courtesy of Malu Tansey. Researchers have identified a new genetic variation that confers an increased risk for late-onset Alzheimer's disease. The finding is a result of a collaboration between deCODE genetics in Iceland and Alzheimer's researchers at Emory University School of Medicine and from Germany, Norway and the Netherlands. The results were published online Wednesday, November 14 in the New England Journal of Medicine. The new variant increases risk by about a factor of three, an effect that is similar in size to that of the most common genetic risk factor for Alzheimer's, ApoE E4. However, the new variant is more rare: it is found in one in every 160 people in Iceland, compared to more than 17 percent of the population for Apo E4 and higher in other countries. People who carry the variation and do develop Alzheimer's disease do so roughly three years earlier than non-carriers. Although rare, the new variant is important because it adds to a growing list of genes linked to Alzheimer's disease, and it provides clues to causal mechanisms. 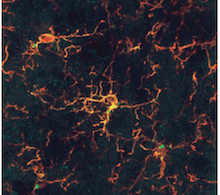 The mutation is in a gene, TREM2 (triggering receptor expressed on myeloid cells 2), which is expressed in microglial cells — not neurons — and appears to regulate inflammation in the brain. These findings suggest that altered microglial function and inflammation are risk factors for Alzheimer's disease. The mutation was identified by reading the entire genomes of 2261 people in Iceland, and sorting through which genetic variants were statistically connected with Alzheimer's. The genetic link was confirmed in separate groups of Alzheimer's patients and healthy controls from Atlanta, Oslo, Rotterdam and Munich. "The new genetic risk factor strengthens our understanding of how Alzheimer's disease works," says Allan Levey, director of Emory's Alzheimer's Disease Research Center and chair of neurology at Emory University School of Medicine. "First, the results demonstrate that certain rare genetic variants can have a strong influence on Alzheimer's disease risk for individuals carrying those variants. Second, since the TREM2 gene is expressed in microglia and other immune cells where it triggers production of inflammatory cytokines, the finding provides growing evidence that chronic inflammation is relevant for the development of the disease, and that modulating TREM2 signaling and microglial function is a potential therapeutic strategy." Alzheimer's disease is the most common cause of dementia in older adults, and affects more than 5 million Americans. A characteristic of the disease is a toxic protein fragment called beta-amyloid that accumulates in plaques within the brain. Rare genetic variations that lead to higher levels of beta-amyloid production are linked with early-onset forms of Alzheimer's, which appear between age 30 and 60. "In contrast to early onset Alzheimer's, it looks like the major problem in late-onset disease is not necessarily how much beta-amyloid is being made, but how well it can be removed," Levey says. TREM2 was the only gene besides ApoE and APP, where a genome-wide association was seen in this study. APP encodes the protein that is the precursor for beta-amyloid. The ApoE protein helps to carry cholesterol and other lipids in the blood, and may also be involved in inflammation and damage to the blood vessels that occurs in Alzheimer's. Other recently identified risk genes for Alzheimer's disease are also connected with inflammation, including a complement receptor gene CR1 and the MS4A6A/E and CD33 genes which encode cell-surface receptors in immune cell types. The Alzheimer's Disease Research Center at Emory is supported by the National Institute on Aging, part of the National Institutes of Health (P50-AG025688).